Egyptology Books: All the latest Egyptology Books, Publications, Magazines and Journals. Ancient Egypt Magazine - Dec 2009/Jan 2010: A Relief of Hatshepsut and Thutmose III in Bournemouth. Bob Partridge proposes some possible reasons for the introduction of mummification and dispels some myths. An exploration of the geology and antiquities of Egypt’s Eastern Desert by Colin Reader. 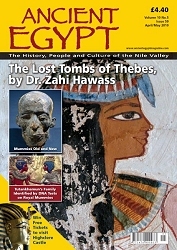 Ancient Egypt Magazine - April/May 2009: Tomb KV63 in the Valley of the Kings, Dental Health and Dentistry in Ancient Egypt, Luxor Temple’s Mosque, Egypt’s Eastern Desert, and the Work of the Egypt Exploration Society. Ancient Egypt Magazine - Jun/Jul 2006: The latest volume features articles on Ancient Egyptian Wine, New investigations on the residue in wine jars found in the Tomb of Tutankhamun, Belzoni’s Sarcophagi. Ancient Egypt Magazine - Feb/Mar 2010: How a fragment of a statue from Saqqara has helped to identify a well-known statue in the British Museum. The geology and antiquities of Egypt’s Eastern Desert. Investigating Early Mummification, the origins of mummification in Egypt. Ancient Egypt Magazine - June/July 2009: The Mosque of Abu Hagag, Dental Health & Dentistry in Ancient Egypt, KV-63 Update: 2009 Seaso, Egypt Exploration Society and The Delta Survey, The Open Air Museum at Karnak Temple, and Tutankhamun’s Headrests. An Ancient Egyptian Herbal by Lisa Manniche: This is one of the very few accessible books on the use of herbs and spices used in Ancient Egypt.